A thigh lift is a surgery done to reshape the thighs by reducing excess loose skin and fat resulting in smoother skin and better-proportioned contours of the thighs and lower body. Why do people choose a thigh lift? Many people desire thighs that are firmer, more youthful-looking and better proportioned to their overall body contours. While targeted exercise may strengthen thighs, most often it does not help people reduce localized fat deposits or excess skin often called “saddlebags” in the outer thighs or in the medial thighs. Despite healthy eating and reasonable exercise, many people find that their thighs do not compliment their overall shape or represent their healthy lifestyle. A thigh lift is an option for those who experience both excess fat and excess skin in the thigh area. If excess fat alone is the issue, liposuction may be the better option for you if your skin has good elasticity. Sometimes a thigh lift is done in conjunction with a buttock lift for a better proportioned lower body or in conjunction with a body lift after massive weight loss. 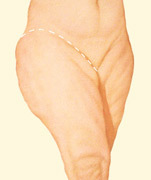 The type of thigh lift done and the extent of the incisions will vary from patient to patient. In a medial thigh lift incisions are generally hidden in the groin area and may be extended downward to the back of the thigh. In most cases, incisions will be hidden by a bikini. Your tissues will be tightened with internal sutures and excess skin and fat will be removed. Skin will then be re-draped to have a tighter, better fit for your new body contours. In a lateral thigh or outer thigh lift incisions are also hidden within the bikini line. The excess skin and fat are once again elevated and removed. The deeper supporting structures are sutured together and the incisions are closed with meticulous care. What can I expect from a thigh lift? A thigh lift offers patients smoother skin and firmer, better-portioned thighs. Skin quality is dramatically improved by a thigh lift. In addition to new thighs, many patients will enjoy an improved self-image and more self-confidence. How can I learn if a thigh lift is right for me? If you’d like to make an appointment for a consultation to learn whether a thigh lift is right for you; contact Dr. Art Armenta’s office. Dr. Art Armenta is a Diplomat and certified by the American Board of Plastic Surgery and is a member of the American Board of Plastic Surgery.